"...Newell is a spectacularly capable director, when a show is in his wheelhouse, and "All My Sons" lands in his sweetest spot. Not unlike the director David Cromer, Newell invariably does his best work when he can deconstruct a seemingly realistic environment, when there is a powerful existing story that can keep his conceptual train on the tracks and allow Newell to foreground, collapse and intensify. And, of course, reveal. He does enough of that here that my mouth fell open at times." "...Arthur Miller's "All My Sons," now in a blistering revival at Court Theatre, arrived on Broadway in 1947 - a moment in this country's history often viewed as the apex of "the American century." It was a time of triumph over the forces of evil in World War II, of pride in the rebuilding of Europe by way of the Marshall Plan and the opportunity for higher education afforded to veterans by way of the GI Bill. It also signaled the arrival of a thriving economy finally liberated from the Great Depression and wartime sacrifices." "...It’s as Greek as Aeschylus, the inexorable tragedy that infects and ultimately destroys two families in Arthur Miller’s “All My Sons.” And in the marvelous, shattering production at Court Theatre directed by Charles Newell, a long Greek shadow falls across Miller’s characters, amid the torment and self-deception, in spectral silence." "...Director Charles Newell approach to this classic play of deceptions and lies is nothing short of tremendous and the timing of the characters is exceptional. Timothy Edward Kane has shown his theatrical, dramatic range in this play we must say "Bravo" to John Judd for given us a masterful performance and Kate Collins is phenomenal." "...A clap of thunder, a flash of lightning, a fallen tree; so begins the Court Theatre's revival of Arthur Miller's "All My Sons" and it is absolutely FABULOUS! Arthur Miller wrote this tragedy based on a true story and it earned the Tony award for best play in 1947. It is a well-crafted tale of greed, secrets, lies and how a family is ruined. In the capable hands of Director Charles Newell, the Court production is seamless and riveting, with a remarkable cast." "...What a mad act of courage it was for Arthur Miller to write "All My Sons." It's the late 1940s, and the United States is drunk on its successes from World War II. Endless, overblown titles - "Leader of the Free World" most notable among them - populate the American lexicon, and there is a general understanding that the U.S. is now the world's dominate power, both militarily and culturally. Yet amidst that outpouring of patriotic further, Miller decides to write "All My Sons," a furious blast of a play that questions not only the moral purity of the American war effort, but also the implications of American empire and global dominance. And courtesy of Court Theatre, Chicago audiences now have a terrific staging of Miller's brave work, which is more relevant now than ever." "...“All My Sons” certainly succeeds as a social drama about an outwardly contented family forced to face guilt from their past. The themes of family loyalty and making money versus the greater good are persuasively debated. In the final summation, Miller’s realistic underpinnings mesh with Newell’s striking vision to create a theatrical and dramatic experience that elevates the drama to a new level." 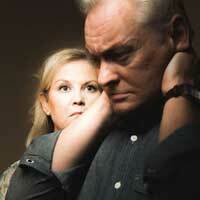 "...Charles Newell's production of Arthur Miller's All My Sons at Court Theatre is an emotionally wrenching tragedy. Secrets and lies that have been hidden for years are gradually teased out. Not until the last few minutes do you understand the enormity of the story and then it punches you in the gut." "...Court Theatre Artistic Director Charles Newell has assembled a magnificent cast and production staff to bring this play to life. For starts, it’s no surprise that Scenic Designer John Culbert’s prior credits include several operas. Get to your seat early enough to study its simplicity in great detail so you can appreciate how every angle, color, and jagged edge was so clearly chosen to frame this grand opera sized story. You too may come away, like this writer, wondering why on earth nobody has thought to make all of Arthur Miller’s works into operas."